Jeet Kune Do and Thai Boxing. This customized program was designed by our founder, Navy SEAL Pat Tray, a Full Instructor and Senior DC Metro Representative of the Inosanto Academy and Thai Boxing Association. One of my core aims is to equip my students with the mental & physical skills and attributes that will enable them to deal with any situation. 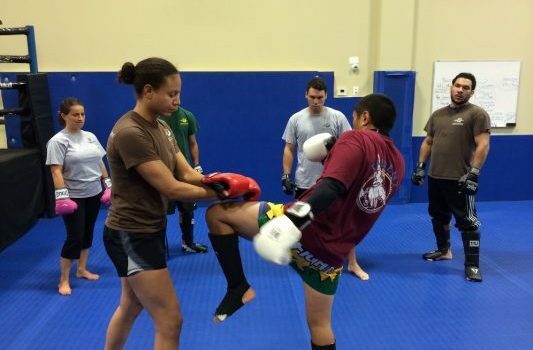 The best of both worlds are brought together in my own Jeet Kune Do and Thai Boxing Cross training, which is straightforward and quick to learn. Come on out and see for yourself why this is the most popular martial arts classes in Northern VA! Jeet Kune Do and Thai Boxing each have numerous benefits but each art also has potential shortcomings, depending upon the environment in which you may find yourself. Consequently Pat Tray created JTX - a complete and effective self-defense system that will physically enhance strength, flexibility, timing, technique and body mechanics, and mentally bolster determination, instinct, perception and confidence. This class is offered 2 times during the week on Monday and Wednesday at 6:30PM and on Saturday at 10:00 AM. Leonard Stevens and Dillon Glover demonstrate a training drill to counter a jab punch, using a parry and "sneaky" back fist that disrupts your opponent creating more opportunities for your own combinations.